CROWN 40MM CHARCOAL BOX: SUPPLIES FOR HOOKAHS – 100pc Box of Quick light shisha coals for hookah pipes. These Easy Lite coal accessories & parts are instant lighting when using a torch lighter. Crown is one of the many brands of quick light charcoal on the market making supplies for your hookahs and are considered to be one of the finest quality quick lighting hookah charcoal brands available. Ordinary charcoals heat the shisha by the heat coming from the burning of charcoal. This results in uneven heating of the shisha, which requires constantly monitoring the temperature of the charcoal. 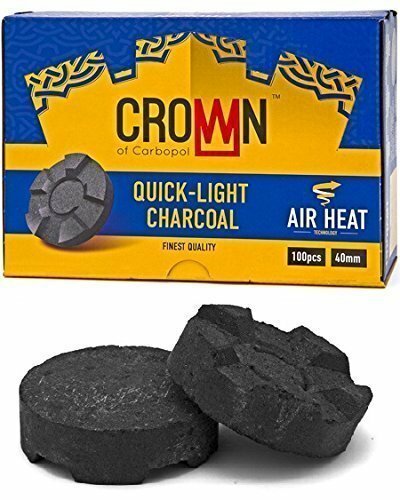 Crown charcoals are the only quick light charcoals with air heat technology on the market. Manufactured in the European union, crown easy lite charcoals in the 40mm box version have 10 rolls with 10 pieces each giving you a grand total of 100 pieces in all. Crown shisha coals can be lit with a torch lighter or open flame offering instant lighting and instant gratification and last for 30 45 minutes per coal. Being primarily used by either avid smokers of hookah pipes or hookah lounges, these accessories and parts are specifically designed for hookah smoking. It is recommended that three rolls of charcoals be purchased for every 250g box of flavored tobacco. EXOTICA COCONUT CHARCOAL SUPPLIES FOR HOOKAHS – 100pc Non-quick light shisha coals for hookah pipes. All-natural coal accessories & parts that are Tasteless, Odorless, & Chemical-free.